If there were musical Olympics with awards offered to the most brilliant, versatile, adventurous and diverse musicians in the world, cellist Matthew Barley would likely be a contender for gold in all categories. 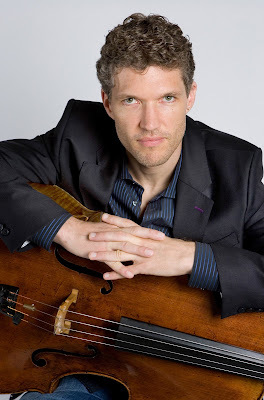 One of the finest cellists of his generation, Matthew has appeared as soloist with top orchestras and in recital in many great concert halls around the world, but he is equally comfortable making music with Indian, Sufi, African, and Jazz musicians or London’s Grime MCs, and his musical passions include improvisation and new music along side education. Matthew Barley visits Concerts Penzance at St. John’s Hall on Friday March 22nd as he travels Around Britten exploring the legacy of British composer Benjamin Britten whose centenary takes place this year. With 100 performances and education workshops across the length and breadth of Britain, Mathew plays in a staggering array of venues, including large and small concert halls, cathedrals and churches, houses and barns, pubs, a cave and even on a lighthouse. Always one to look at the world of music from unusual angles, Matthew’s programme in Penzance sets Britten’s writing for solo cello amongst a diverse mix of contemporary cello music by composers working in Britain in the years since Britten’s death, including Dai Fujikura, John Tavener, James MacMillan, Colin Matthews and Gavin Bryars. The programme also includes improvisations around a remix of the Fujikura score by Norwegian DJ Jan Bang. The concert opens at 7pm with new music for 21 players inspired by Britten’s suites for solo cello, written over the preceding four days by Matthew Barley and Music Scholars from Humphry Davy School – the first big collaboration project of Matthew’s Around Britten tour. The first part of the performance starts at the earlier than normal time of 7pm. Tickets costing £10 (£2 for under 19s) are available from West Penwith Music, Union Street, Penzance 01736 364440 and Mounts Bay Wine, Bread Street, Penzance 01736 364118, and on the door.